It is my personal opinion, based on quite informal observations, that perhaps the biggest reason so many fear leaving religion is because they fear losing their sense of belonging. 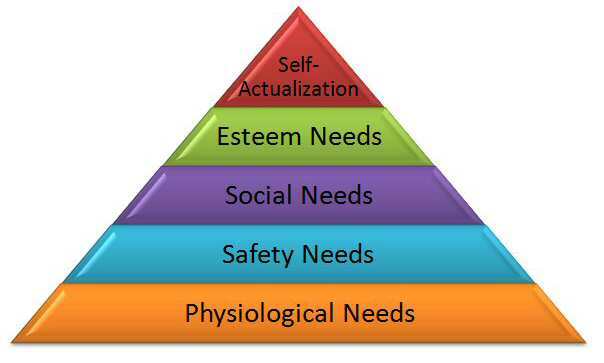 Abraham Maslow observed that all humans have a specific set of needs and they must be met in a specific order for us to reach our full potential, or self-actualization as he termed it. At the bottom of the Hierarchy of Needs are the absolute minimum necessities for us to survive: food, shelter, and safety. Ask any homeless person (I’ve been there myself), its difficult to focus on creating the next big thing or writing the next big novel when you are worried about where you’re going to sleep that night or if you’ll have food tomorrow. We are stuck at the bottom of the Maslow’s gig until we consistently have full bellies and safe shelter. Once these are obtained, we can then focus on the next level of needs which is having a sense of belonging and being loved. We must achieve at least some self-esteem and knowing that we are part of a group, then we can move on to the next and final level of Maslow’s Hierarchy, which is reaching our full potential, being successful, and helping others meet their goals. I often wonder if many people stay in the church simply because it is their only source of belonging and sense of community. It is a powerful feeling to know you are wanted and even needed by others. I think this is especially true in the church setting where typically small congregations provide acute environments that affirm feelings of importance. 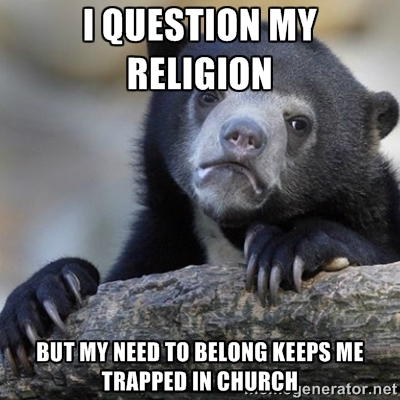 If a person began to question the indoctrinated principles their particular denomination espouses, if there are no alternatives to take the place of this sense of belonging, it is highly likely they will stay within the confines of religion – trapped – because the psychological need to belong and feel loved is real and strong. It is not necessarily a conscious choice I suspect. From another angle, there is the ‘big fish in a small pond’ dynamic that I believe keeps some trapped within the walls of religion. Its a mighty big world out there, and if I venture into it, I am just another part of the school. Inside a church or mosque or temple though, I have some import. I might be a children’s church director, or imam, or rabbi to a small community – I am a big fish in a small pond. Any human would have a rough time giving that up. Statistics show that more and more people are questioning their faiths, some of them may turn to us who have already trod the path for answers. We should be aware of the power of the need to belong. We need to offer support where there might not be any. We need to form bonds within our communities so that we exemplify the idea that belonging is also achieved outside the four walls of a building. It’s not easy to leave the confines of religion for many many reasons. I suspect the psychological need to belong presents one of the greatest challenges to leaving the four walls of the church. I am confident that we atheists can rise to the occasion and be sensitive to the issue, provide support, and form bonds to help our brothers and sisters. This entry was posted on Thursday, April 23rd, 2015 at 13:48	and tagged with atheism, atheism and christianity, atheist, being an atheist, christianity, islam, judaism, leaving religion, life, lifestyle, living, maslow's hierarchy of needs, maslow's triangle, questioning faith, religion, the psychology of church, the psychology of religion and posted in Uncategorized. You can follow any responses to this entry through the RSS 2.0 feed. Some great points about Maslow. Hopefully as atheists and agnostics grow in number and are more open about their lack of belief, better communities can form that can replace the church community structure, minus the whole fear of damnation and belief without proof thing. thanks for checking in…oft times being aware of the underlying issues is key to productive conversations. I can definitely relate to this. I grew up in the Unification Church (think Mormons+Korea+arranged marriages) and I’m sure I would have stayed a lot longer if I felt I fit in better. Even then, it was really hard feeling like I’d lose my friends and devastate my parents when I left. If I’d been raised in a more mainstream religion, I don’t think I would have needed to challenge my beliefs as much and might have gone on thinking that I believed in God.